If you are going to the CLA Game Fair next week – Friday 18th to Sunday 20th July – you are invited to drop in at our stand – K481 – and enjoy a cup of our home made elderflower cordial. It’s so refreshing on a hot day. Our stand will be under the names of: SalmonSchool and TROUTinNZ and Real Farm Holidays in the fishing “village”. The Game Fair itself is at Blenheim Palace in Oxfordshire………. We will again have a fun competition – “guess the weight of a fish”. Last year it was done from photos but this year it will be a bit more realistic …. but not 100% realistic! … come and see! Robert Feenan won last year and has recently enjoyed his holiday at Kirkwood. We enjoyed welcoming him too. Maybe you will win the free holiday in 2014…..
We have been offering our holiday visitors quad biking around Kirkwood farm, for many years. This year we are now offering 4×4 rides in our Landrover Discovery, and tractor driving. Its all part of the experience of holidaying at a real farm – Kirkwood. There are age limits of course and remember being a working farm everything is a bit dirty! We will have a quad bike at the Fair for a photo opportunity but you/we cant drive it there – you must come to Kirkwood on holiday to do that. 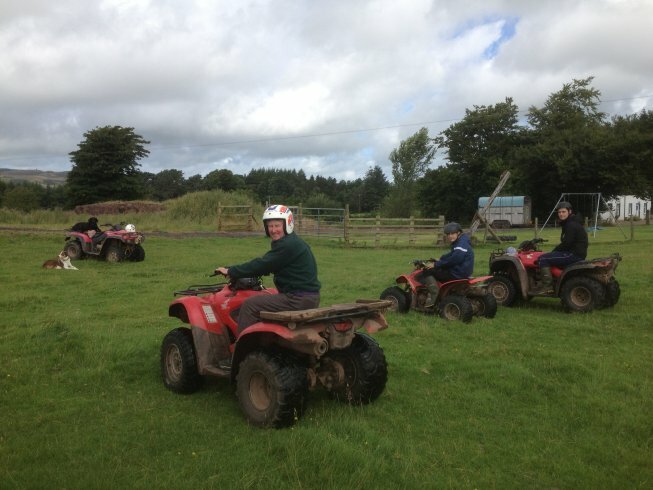 Driving farm vehicles are just some of our real farm experiences – you can also feed our pet lambs, collect our hens eggs, walk in 100 acres of oak wood or go rough shooting at some times of the year and do lots of fishing most of the year …. Mainly we specialise in fishing and we have stretches on the river Annan to fish. In the Autumn we normally have great runs of salmon and that is when we organise the widely acclaimed SalmonSchool. It is now in its 9th year. It is increasingly popular and achieves fantastic feedback. We have an “advanced” version and a “ladies only” version. In the Summer its mainly sea trout, although there’s always the chance of a salmon or some big brown trout which are the main target in the Spring. Increasingly the Annan is known as the best venue in the UK for big wild brown trout – we catch 5lbs and 6lbs fish regularly. If its big wild trout that appeals to you, then – when the Annan is closed each December to March – the best place in the World to go is New Zealand and so that’s where Anthony goes – to help, advise and organise visitors see TROUTinNZ . It will be busy at the Game Fair but you will find no-one more enthusiastic and passionate to talk to about trout fishing than Anthony – on stand K 481. 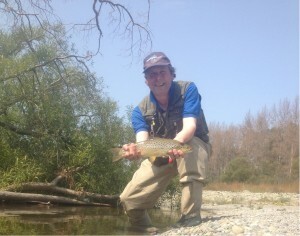 The SalmonSchools are booking up fast now and so secure your space now ! ps we have some late availability bargains this summer in our self catering houses – ask now!